Unlike this kaleidoscope of a month, this post will be mostly brown. I decided to grow squash next year. I wanted to grow it this year, but was too greedy for real estate within the safety of the deer netting. 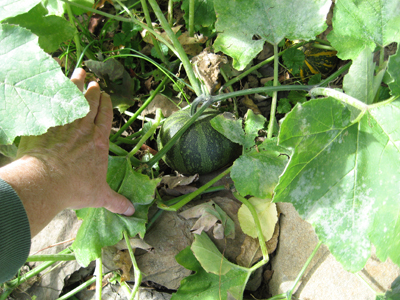 Squash was too sprawl-y, compared with the more restrained, mannerly vegetables. I was certain the deer would eat anything that I really really wanted. So I resigned myself to opening my wallet for kabochas, butternuts, spaghettis, and acorns. ...the deer left it alone! Gentle slope, tipped towards the east. Perfect! The circles are roughly 3-4 feet in diameter. 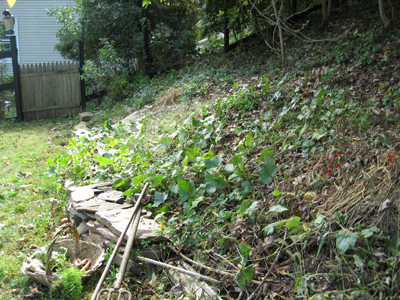 My idea was to create three squash hills that began their careers as mini-compost heaps. 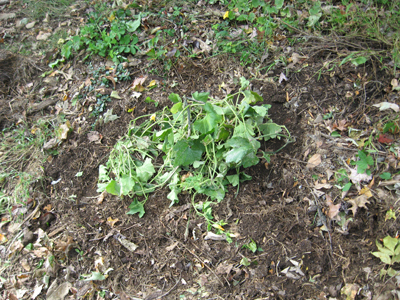 Coiling up the green part of the biomass, in this case the volunteer gourd vine that gave me the idea to grow squash here in the first place. 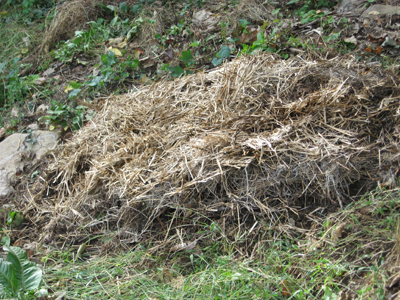 In this case, the leftover straw from the bales I'd bought to cover my garden paths. 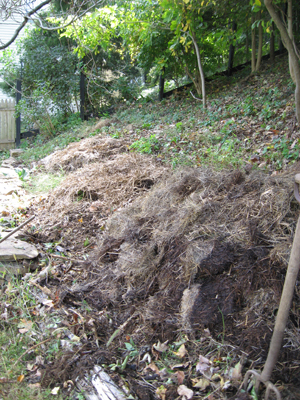 I will add one more layer to these three hills: green and brown, and then, off they go, into the winter! In the spring, I will add a layer of top soil, and then the fun begins. 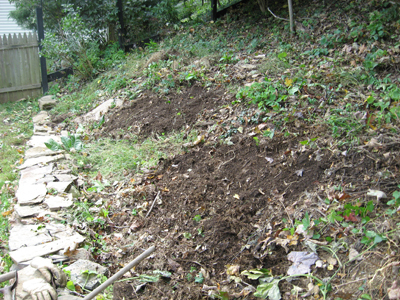 I will plant each hill with squash seeds. What will I choose?! Kabocha is a certainty. Butternut, maybe. Hubbards? The name alone warrants a close look. Acorns? Possibly. Spaghetti squash? Likely. I will let you know, of course. are tied with the rainbow. Listen! the rain’s drawing near! The voice of the bluebird is heard.